One of the many benefits of staying at a Boston bed and breakfast, is the access to insider information & tips. The information you acquire at a downtown B&B will transform you from an everyday tourist to a jetsetting vacationist. As professional travelers, we find this to be very true, not only for the sights & attractions but also the restaurants. At Clarendon Square, we leave the food & wine to the experts (at one of the nearly 40 plus restaurants) in the South End. Everyone always wants to know the best restaurants in Boston, so, we make consistent effort to sample the unique dishes that each eatery has to offer. This can keep us quite busy, as there are always new restaurants popping up in Boston and the South End. Even with new restaurants coming constantly, there are definitely the standouts that have become Boston culinary staples. 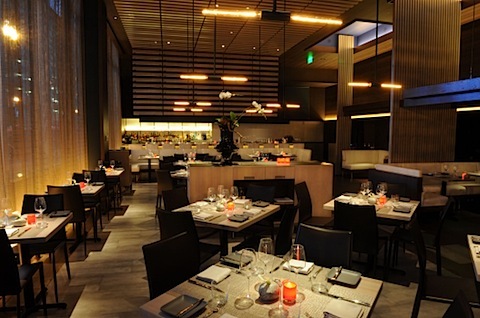 One of our favorite places to dine is Market by Jean-Georges. The understated yet sophisticated dining room has the perfect balance of energy & peace. The service is very nice as well. The food is exactly what we love. A diverse menu, has a collection of starters, salads & raw bar, which provide you with the possibility of sharing or order multiple courses. The main dishes, are delicious as well with a great selection or seafood, meats & even vegetarian. The sauces & seasonings are refined with a slight exotic flair. 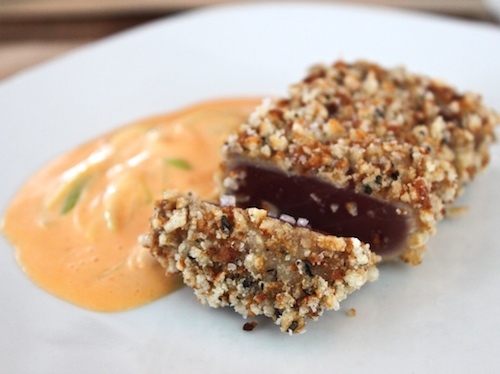 One of our favorites is the Rice Cracker Crusted Tuna. Next time you are thinking about things to do in Boston imagine the culinary adventure waiting for you at Market. Alone or combined with a night at our beautiful bed and breakfast & an evening in Boston’s theatre district will leave you feeling indulged and enlivened. Market by Jean-Georges in Boston is an incredible opportunity to sample the culinary artistry of Chef Jean-Georges. He has a handful of other restaurants in New York City like his namesake Jean-Georges Restaurant or Spice Market, which are considerably pricier than their Boston counterpart. Also consider the restaurant in the West Village, called Perry Street, which is the first restaurant of his son, Cedric. This entry was posted in Uncategorized and tagged boston bed and breakfast, boston new restaurants, clarendon square, Jean-Georges, Market by Jean-Georges, Rice Cracker Tuna, south end restaurants by admin. Bookmark the permalink.